24 January, 2012. It was a Tuesday. To keep things simple, I created a calculator using nothing but functions. 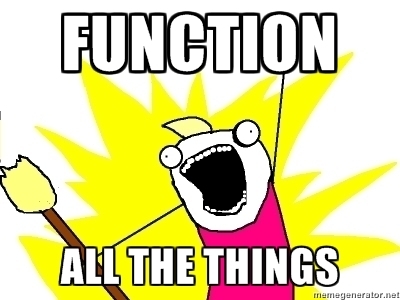 Each function takes other functions as parameters and returns a function. The only exception to this is the simple `value` function which takes a value and returns a function that itself will return the original value. These are the interesting points that stand out in my head. I’m not sure if these are “correct” or not… it’s just what pops out in my mind. If anyone has any corrections and additional thoughts or notes, I’d love to hear them – just drop me a line in the comments, below. I’ve represented everything as a function – even the simple values of 1 through 4. And every function returns a function, except for the simple values, which return a function that returns the actual value. In the process of returning functions from functions, I’m representing the state of the application as a series of functions. This one is a bit odd for me to wrap my head around. I’m not sure if this is really correct, or if it’s just an oversimplification of what’s really happening here. There are no data-structures, though, only functions. So it stands to reason that the state is stored as a series of functions that can be evaluated to produce a result. Update: The Wikipedia article on functional programming says that fp “avoids state”. So… am I wrong in thinking that I’ve represented the state with functions instead of data structures? The result isn’t actually evaluated until I invoke the`resultFunc` in the above example. But I have the `resultFunc`available as a variable and I can pass it around anywhere I want. This basically turns it into a command pattern implementation, only in a functional manner instead of an object manner. All of these functions are side effect free. None of them actually mutates any existing application state. Of course this is a really simple implementation, but that was one of my goals. I’ll need to play with some more complex ideas in order to really see how side effect free would play out. One of the benefits of side effect free functions is that the code in the sample is far more declarative and compose-able than most code I write. Since each function does one very small and very simple thing, taking in other functions as parameters, it’s easy to build things. This is something that I’ve played with in other languages, and I like this aspect of functional programming. It’s a great way to build DSLs for example. Oscar Godson posted a version of my code alongside a prototypal version for a comparison. I think it’s easier to read and understand the chaining, though. It also reminds me of LINQ and monads – pipes and filters with a single result coming from the end of it. If you’re interested in seeing this code, it’s on Github. I’m thinking about taking this a little further over time, just for fun. I’ve posted these comments in the read me (actually – they started there…) and I’ll continue to update the read me as I progress (assuming I actually do continue exploring this and don’t just forget about it like so many other things). This is really pretty simple stuff… but it’s fun to write asimple exercise like this and think about what’s going on, why and see how it affects the way I think and approach software development. ← HTML5 And Internet Explorer: Modernizr To The Rescue!